A group of young artists is redefining the formerly folksy medium with sleeker, more sophisticated forms. 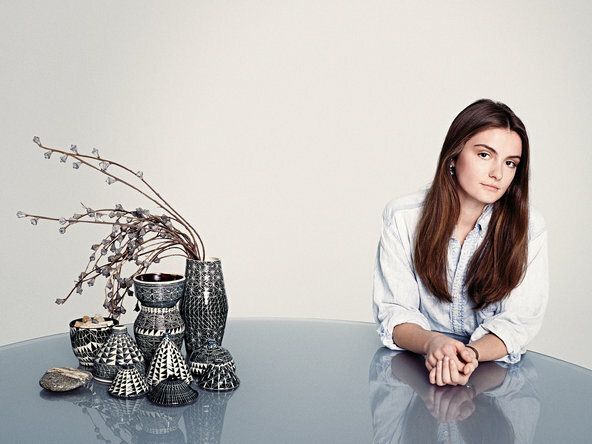 Since graduating with a degree in sculpture in 2012, 23-year-old Dana Bechert has been focused on developing a ceramics line. For her highly graphic black-and-white vases and planters, Bechert uses a variation on the traditional Acoma Pueblo style of Native American pottery decoration, but one stripped of bright colors and animal figures to create something more abstract and intricate. “The carving is all done freehand, and is much more organic than it may appear,” says Bechert, who can spend up to seven hours on a single piece. She likes to control all aspects of the process, even foraging for the different colored clays she uses in the vessels and the plants she places in them. Bechert also collaborates with friends on experimental food design projects, such as recently creating a series of pour-over coffee funnels. “I think of my work as a tool for accessing the most fundamental and beautiful aspects of daily life: enjoying and sharing food and drink,” she says. After studying ceramics at the School of the Art Institute of Chicago, 25-year-old Ben Medansky helped the whimsical L.A. design duo the Haas brothers set up a ceramics studio and apprenticed for Peter Shire, one of the key members of the Memphis design group (whose Pop Art-inspired pieces are having a bit of a renaissance). But once he struck out on his own a year ago, he took a more understated approach, mostly adding and subtracting simple geometric shapes from vessels made with his signature white speckled clay. For his newest series, inspired by motor gears, power plants and radial fins, he used an industrial extruder to create the phalanges. “I like the idea of controlled chaos, where there’s a curated mess on top of a perfect cylinder, referencing the mechanical world but also a naturalistic world,” he says.